December has officially hit, and this means holiday shopping, christmas music, cuddles in front of the fire, -17 degree walks to work and snow! Our holiday shopping is almost done (it helps having Chanukah in November! 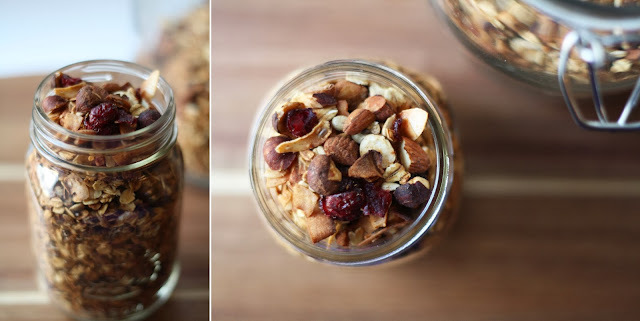 ), but I've decided I may add some granola to the pile under the tree this year. That being said, I'm on a mission to find the perfect wintery mix. Attempt number one was jam packed with delicious ingredients, and the hazelnuts and cranberries were super festive! In a large bowl, combine all the dry ingredients (save the cranberries until after the oven). In a separate bowl, melt the coconut oil. Add the honey, water and vanilla and whisk to combine. Pour the wet mixture over the dry, and using your hands, mix well to combine. Spread the mixture out on 2 parchment lined baking sheets. Bake for 20-25 minutes, checking frequently to avoid burning. Once removed from the oven, add the cranberries while the oats are still hot. Let cool completely before storing.